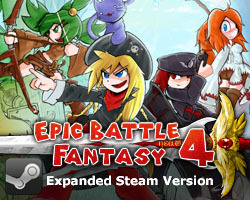 I found a super cool speed run of Epic Battle Fantasy 4 that was done a while ago. I’ve only watched the first 10 minutes and I’m already very impressed, so watch at least that much if not the whole thing. I didn’t think EBF had interesting speedrun potential, but this video shows otherwise. If anyone knows other cool videos of my games that I might have missed, let me now! 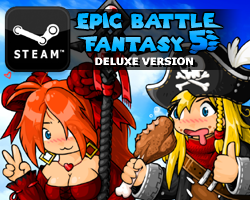 This entry was posted in Epic Battle Fantasy 4 on May 11, 2018 by Matt Roszak. Oh, that’s pretty cool too! It’s really not. You probably barely watch speedruns. If you think that people can use that to get hard achievement though, well, that doesn’t matter either because all of the achievements obtainable via just access by map can easily be obtained by playing on easy and then replaying on NG+ for the rest on epic. as some on that likes to collect everything in games, this makes me sick how she just goes though the game not killing anything (dident watch to end) and skipping most loot. “loot is love, loot is life” – as said by me. As someone who DID watch to the end, after about 26 min using the exploit to farm loot, the player then spent a solid hour and thirty or so farming mobs using almost explicitly Matt and Revenge to kill foes. That’s basically how they did it. Got Matt high level and had him slaughter things with the power of dead allies. While I’m more for “play the game the way it is meant to be played”, I appreciate alternative approaches to a game, as there is ALWAYS something to be gleaned. Like for example… if I wanted to do a Matt-only run, that is very very possible. Seriously dude no need to look down on cheaters (this isn’t a competitive game anyway). You enjoyed the game, they enjoyed theirs. That’s all that matters. Of course if you were offended in any way then I apologize in advance. Anyway I’m pretty sure Matt’s not gonna deliberatitely leave exploitable glitches in EBF5, so whatever bugs that may occur will most likely be unintentional. Ok! I didn’t even know this game had glitches! Assuming 5 will be using the same engine as 4, this should still be possible, right? I’d call it a good move to leave it in, and try to develop a speedrunning community, as those massively boost the popularity of games. Being able to have a good ~1-2 hour run makes it good GDQ material, and also promotes “real” speedruns of glitchless or epic (which, even using glitches, couldn’t solo the game using revenge Matt, showing off more of the combat). NewGame+ is very easy, but that’s still very fast!